Do you ever need to give your email address for a newsletter or a list, but you’re concerned about your email address getting into the wrong hands? While creating a new email account with a different email host can be a good option, you might prefer to keep using your Yahoo Mail email. One way to deal with situations where you are concerned about the safety of your email address is to create a disposable email address. 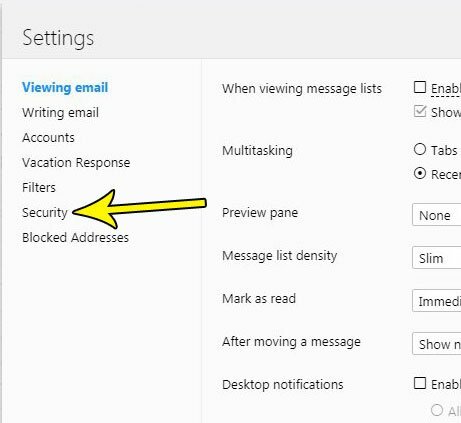 This allows you to give someone an email address where you will still receive the message, but it doesn’t expose your actual email address to them. 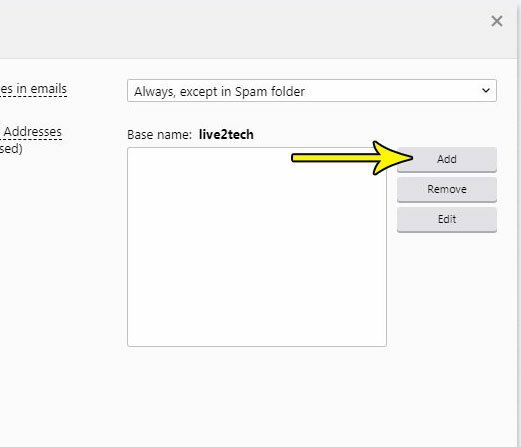 If you find that the disposable email address is getting spammed, you can simply delete it and stop receiving that spam. 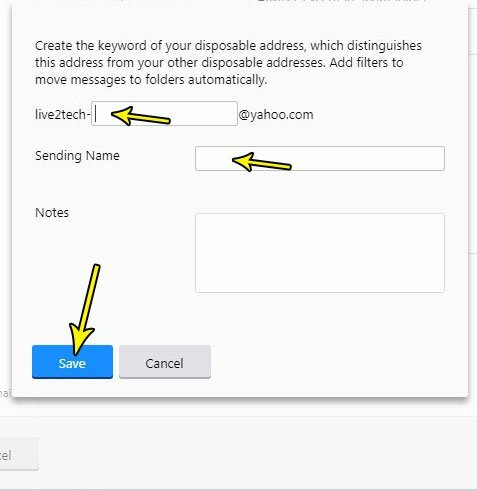 Our tutorial below will show you how to create a disposable email address in Yahoo Mail. 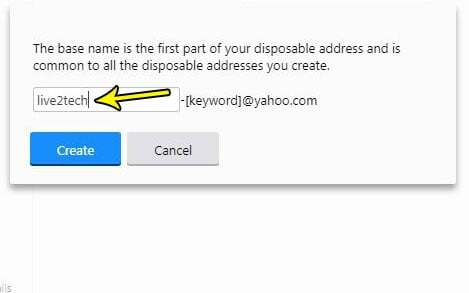 The steps in this article are going to show you how to create a disposable email address in Yahoo Mail. People will be able to send you emails at this disposable email address and they will still arrive in your inbox. However, the sender won’t know your actual email address, allowing you to keep it private if you don’t wish to share that information with the sender. 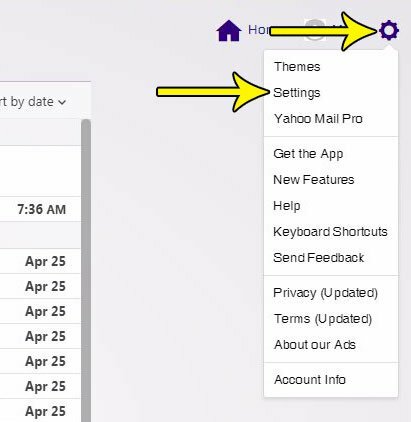 Step 1: Go to https://mail.yahoo.com and sign into the Yahoo Mail account for which you wish to create the disposable email address. Step 2: Click the gear icon at the top-right of the window and choose the Settings option. Step 3: Choose the Security tab at the left side of the menu. Step 4: Click the Create base name button at the center of the window. 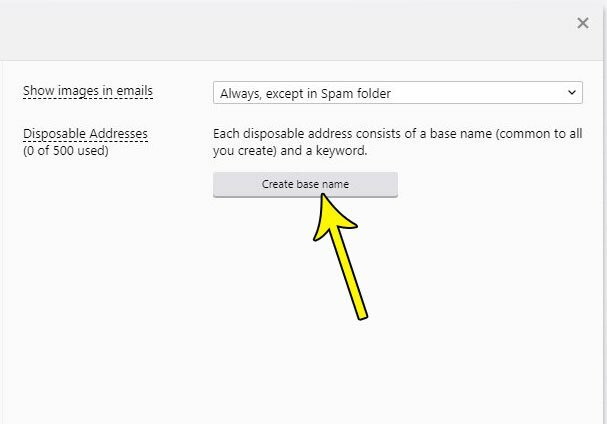 Step 5: Type the base name for the disposable email address into the field at the center of the window, then click the Create button. Step 6: Click the Add button at the right side of the window. Step 7: Enter a keyword into the field to the right of your base name, add your sender name and any notes that you wish to add to this account, then click the Save button. Note that if you reply to an email that was sent to your disposable email address, Yahoo Mail will send it from your real account. So it’s best to avoid responding to these emails unless you are comfortable with the recipient knowing your real email address. Have you been thinking about ditching your cable plan, and you’re looking for something to let you stream Netflix and other apps? Find out more about the Amazon Fire TV Stick and see if it’s something that could be useful for you. How Many Apps Are Installed on My iPhone 7?